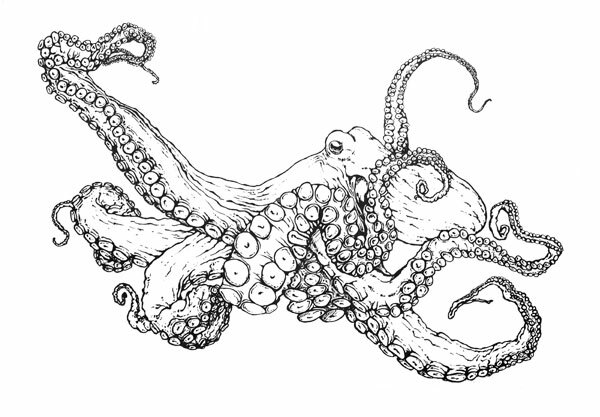 Animal coloring page to print of a common octopus. Animal drawing art description: Fine art animal drawing scientific illustration of common octopus, octopus vulgaris. Black ink, drawing by Madeleine Dubé. Common octopus drawing artwork available for sale as greeting cards, postcards and high quality print reproductions (8"x10" and 11"x14"). Common octopus image available for licensing. Ideal for commercial uses such as print, packaging or advertising. For information contact me by email or by phone: 1-514-770-0705.